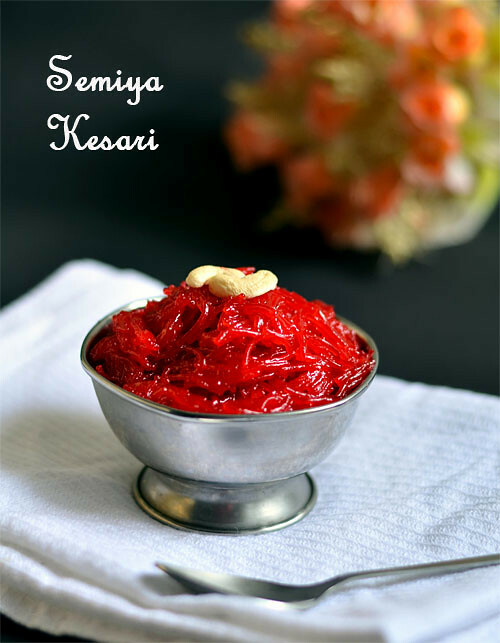 Semiya kesari recipe / Vermicelli kesari is one of the easy n yummy Indian dessert recipes. Making a perfect semiya kesari without milk or condensed milk was my dream I should say. When I was a beginner in cooking kesari recipes, I have tried this many times but I ended up making vermicelli halwa or half cooked hard, chewy kesari. Recently I applied my rava kesari technique and used more water to cook the vermicelli. It came out perfect this time ! I was so happy with the results and it tasted great. So thought of sharing this recipe with u all. But one thing which I felt bad is the color of this kesari. I have added more food color by mistake & my kesari resembled beetroot halwa. So please be careful while adding food color. I have not used fine vermicelli here. I used the normal, thick roasted vermicelli( Bambino). So adjust the quantity of water based on the vermicelli. Its very to easy to make if you follow the steps carefully. Even beginners and bachelors can give a try. Ok,Lets see how to make vermicelli kesari/semiya kesari recipe with step by step photos ! Heat 2 tsp ghee in a kadai. roast the cashews, raisins. Remove in a plate. Add vermicelli and roast for a minute. If you use roasted vermicelli, you can skip roasting it. Heat water in a kadai and add 1 tsp ghee to it. When the water starts to roll boil, add the roasted vermicelli and a pinch of food color. Mix well till all the water is absorbed by the vermicelli. Cover & cook for 10 minutes in low to medium flame. Mix once in the middle. Make sure the bottom is not burnt. Check whether the vermicelli is cooked properly. For this, take few strands of vermicelli and try to mash it with your fingers. If it breaks & mashes,its cooked right. Now add the sugar and mix well. The mixture will become watery as soon as you add sugar. Mix well in high flame for a minute. Mixture will thicken slightly. Bubbles will appear all over the sides. When you mix it, you will find the kesari becoming non-sticky and start to leave the kadai. Add the remaining ghee,cardamom powder. Mix well & switch off the flame. Transfer the mixture to a plate when the mixture is watery. Do not wait for the kesari to leave the sides of pan completely. It will become chewy when it cools down. So remove the mixture when it is wet and slightly watery. It should fall into the plate like a ribbon.This kesari will set perfectly once it cools down to room temperature. Serve once it becomes warm. If you want to serve really hot, mix it for few more seconds to drain the excess water. I guess nobody will eat it hot from the stove ;)).So its better to remove it when there is little moisture in kesari. Garnish with roasted nuts and raisins. Enjoy ! 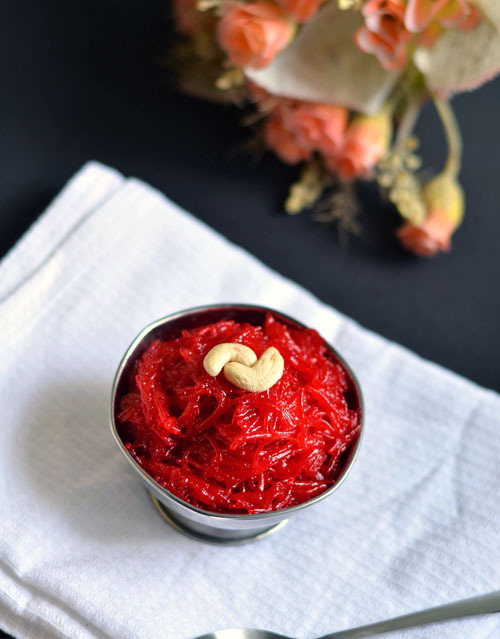 Two most important things you should notice while making this kesari is : Vermicelli should be cooked properly. Do not mix for long time till kesari leaves the sides of pan completely. As soon as you see the kesari thickens and start to leave the kadai, remove it from the stove. Mixture should be slightly watery and wet. I used 1:5 vermicelli and water ratio.If you use fine vermicelli, use 1:2 water. If you use fine vermicelli, add 3/4cup of sugar for 1 cup of vermicelli. 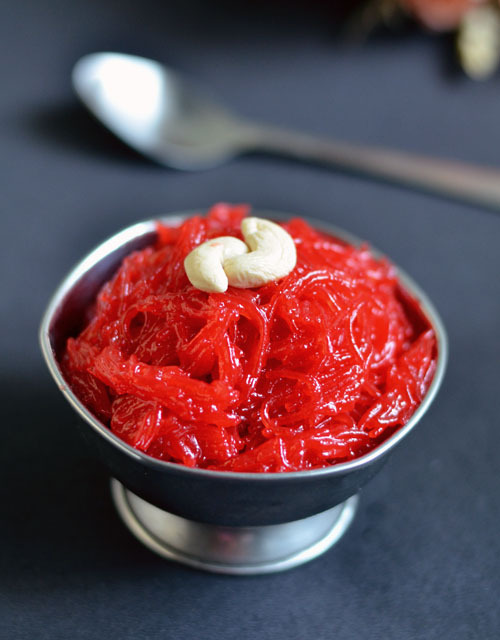 Check whether the vermicelli is cooked properly before adding sugar because the kesari will turn hard and chewy. Semiya kesari takes less ghee than rava kesari.So use less. Remove the kesari when the mixture is slightly watery. It will set well as soon as it becomes warm. Do not mix till it leaves the sides of pan completely. what a color.. Tempting clicks so yum! I was thinking u used some dark pink colour :) .Easiest but trickiest kesari recipe,perfectly made. Perfectly made!! The colour looks so bright. Beautiful.